Compact, easy-to-use, and reliable. The Boss TU-03 is a high-performance chromatic tuner with an advanced metronome built into one little piece of essential kit. You're certain to find the TU-03 useful whether rehearsing, performing live, or recording. 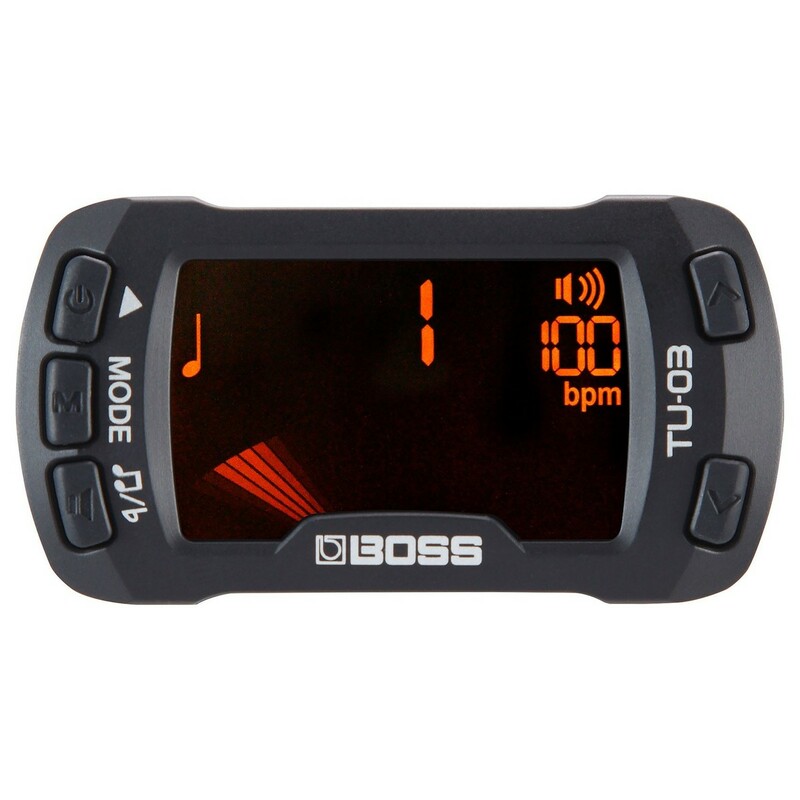 The Boss Clip-On Tuner is designed to clip-on to most stringed instruments including a guitar, bass, or ukulele. Clip-on to your headstock and choose from five different tuning modes including chromatic, guitar, bass, ukulele, and violin. An advanced metronome offers either patterns and ten beat variations, perfect for improving your timing. Furthermore, its spring loaded clip and flexible pad ensures secure and stable attachment to your headstock. 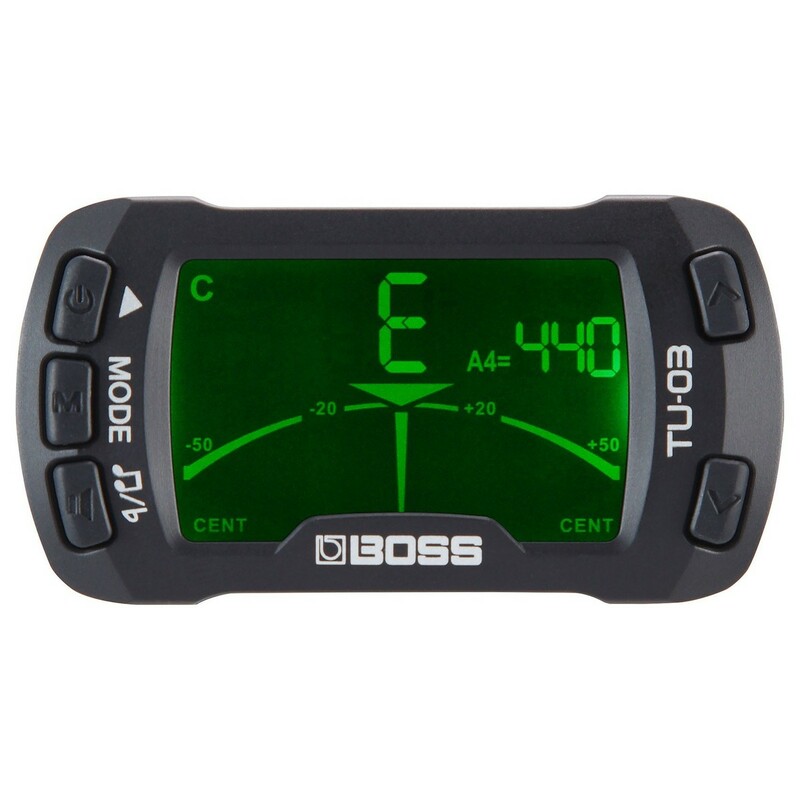 This high-performance Boss tuner combines incredible tuning accuracy with a compact unit that is designed and built to last. 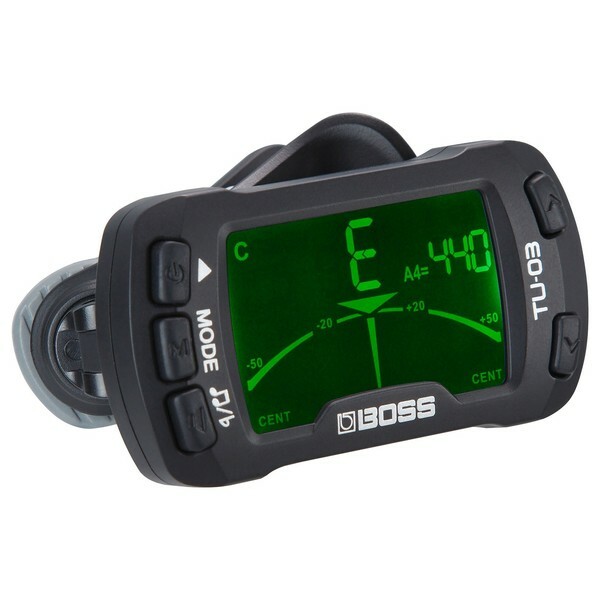 The Boss TU-03 offers superb tuning accuracy thanks to its brilliant design and built-in chromatic tuner. Its large and easy-to-read display allows you tune up or down quickly and efficiently. High-performance and designed with an audible reference pitch function and support to ensure precision for flat or double-flat tuning. Additionally, the TU-03's chromatic mode also ensures tuning accuracy to any pitch. You can also achieve precise and easy tuning for multiple stringed instruments including guitar, bass, violin and ukulele. Precision, accuracy, and durability - it's Boss. Practice and improve your rhythm and groove with the TU-03's on-board advanced metronome. By combining an incredibly accurate tuner with an advanced metronome, you receive two essential musical tools in one compact housing unit. A built-in speaker allows you to hear the metronome beat with ease, and with the unit's secure mounting design, it has never been more convenient to practice your timing. You can also follow the metronome's beat shown on the TU-03's display or turn down the volume and use the display purely for silent rhythm practice. Furthermore, eight different patterns and ten beat variations allow you to practice numerous playing styles and time signatures. Lastly, you can adjust the metronome's tempo from 30-250 BPM. Versatile and ideal for your gigging and rehearsing needs. Built to last and easy to view in any environment. The Boss TU-03 features a spring loaded clip with a flexible pad to ensure stable and secure mounting. Ideal for all types of headstocks and multiple stringed instruments, the Boss TU-03 is an idyllic little companion for you, your band, and your performance. Whether you're in a dark grungy venue or the brightness of daylight, the integrated backlight and non-glare surface bring you easy viewing, tuning accuracy, and convenience in a compact, affordable, and easy-to-use unit.